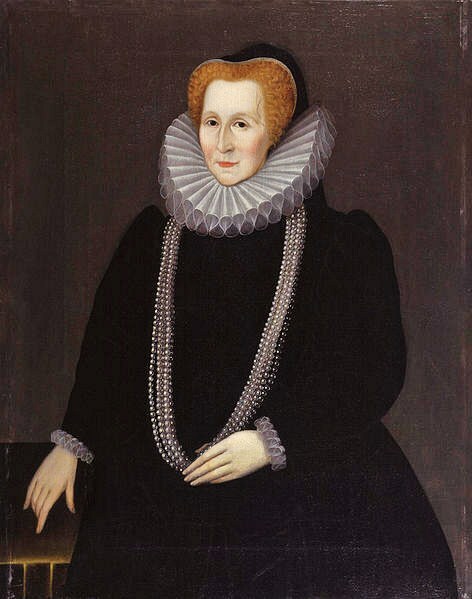 Elizabeth Talbot, Countess of Shrewsbury, (1518-1608), usually called "Bess of Hardwick," was the daughter of John Hardwicke of Hardwicke in Derbyshire. 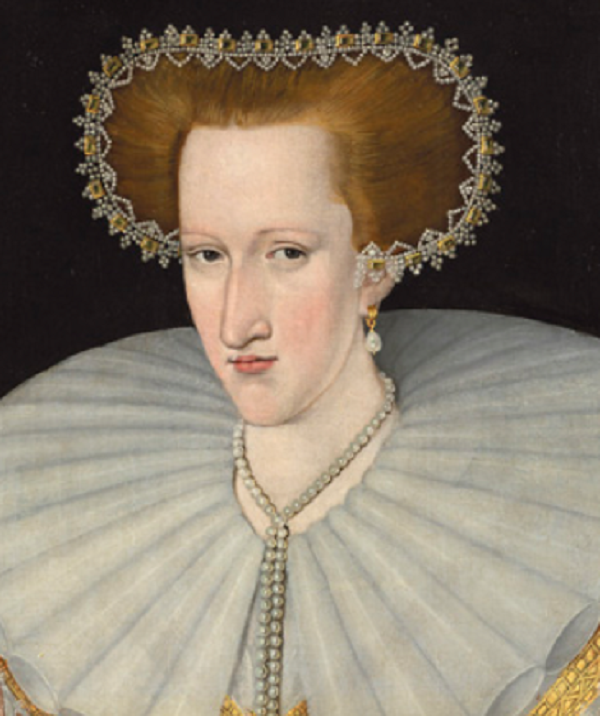 She became a handmaiden to Queen Elizabeth I, & she remained one of the Queen’s best friends. However, she was sent to the Tower twice by the Queen for her attempts to promote her own wealth & influence. At the age of 12, she became a maid in the household of a wealthy Derbyshire family, Sir John & Lady Zouche of Codnor Castle. Her job began in London, where Bess met co-worker Robert Barlow, who was ill. Bess nursed Robert. He fell in love with her, & they married. Bess was 13, & Robert was not much older. Robert died soon, & Bess gained a customary widow's jointure, which was a 1/3 of Robert's income plus his lands. 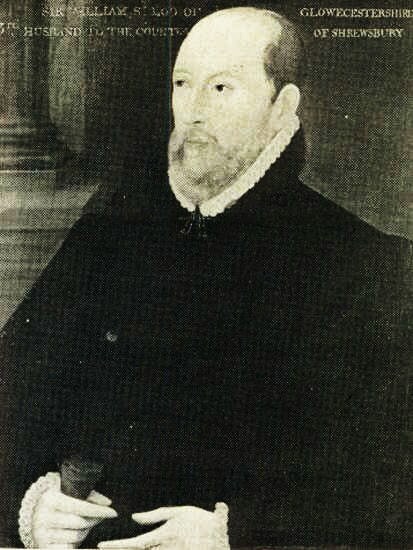 Bess did not marry again until 1547, when she married wealthy widower Sir William Cavendish 1505–1557. Cavendish was a Royal Commissioner employed in the business of disolving monasteries. He was granted church land for his services & was able to buy other land cheaply. Bess, 22 years his junior, was his 3rd wife. To please his new, young bride, Cavendish sold his lands in the south of England & purchased land in Derbyshire. He purchased the Chatsworth estate in 1549, & the couple began to build Chatsworth House in 1552. Eight children were born of the marriage, two of whom died in infancy. Of the six who survived, three were sons (Henry, 1550-1616; William, 1551-1626; & Charles, 1553-1617) and three daughters (Frances, b.1548; Elizabeth, 1555-1582; & Mary, 1556-1632). Elizabeth I was godmother to their 1st son, Henry; & Queen Mary I of England was godmother to their 3rd son, Charles. Bess learned her accounting & estate management from Sir William, lessons that prepared her to acquire future wealth. Upon Sir William's death, Bess was appointed lady-in-waiting to the Queen of England. 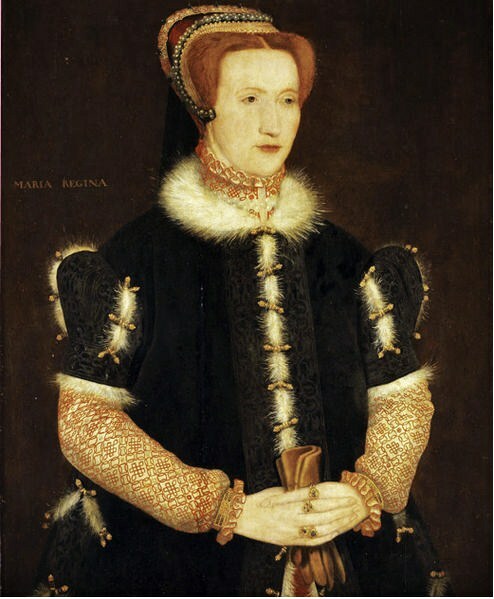 In 1559, Bess married Sir William St. Loe 1518–1565, another wealthy widower. She insisted that his lands should be settled on her & her heirs; & when he died, all his wealth passed to Bess. 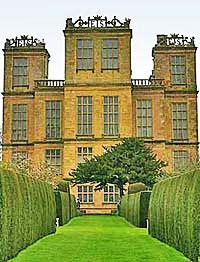 Bess of Hardwick was now the wealthiest subject in England. She chose her next husband with an eye toward keeping that status. With the approval of Queen Elizabeth, she was married in 1568, for the 4th time to George Talbot, 6th earl of Shrewsbury, a widower with 6 children. He was regarded as the richest nobleman in England. Bess made her usual demands for future estate settlements. To keep all the money in the famiy, Bess also insisted on arranging marriages between 2 of her children by Sir William Cavendish & 2 of the earl's by a former marriage. Mary Cavendish (12 years old) was married to Gilbert Talbot, & Henry Cavendish (18 years old) was married to Grace Talbot (8 years old). 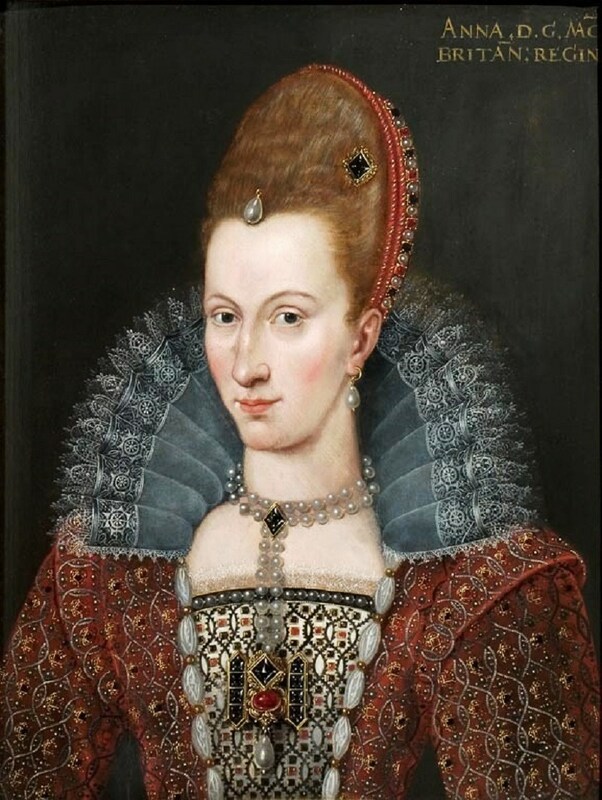 Always interested in increasing her wealth & political power, in 1574, the countess took advantage of a visit of the countess of Lennox to marry her daughter Elizabeth to Charles Stuart, the younger son of the Lennoxes & brother of Lord Darnley, the 2nd husband of the queen of Scots. She acted without the knowledge of her husband, who declined to accept any responsibility. As the Lennox family had a claim to the throne, this match was considered as a proof of the royal ambitions of the countess of Shrewsbury; & she was sent to the Tower by the queen, but was soon released. 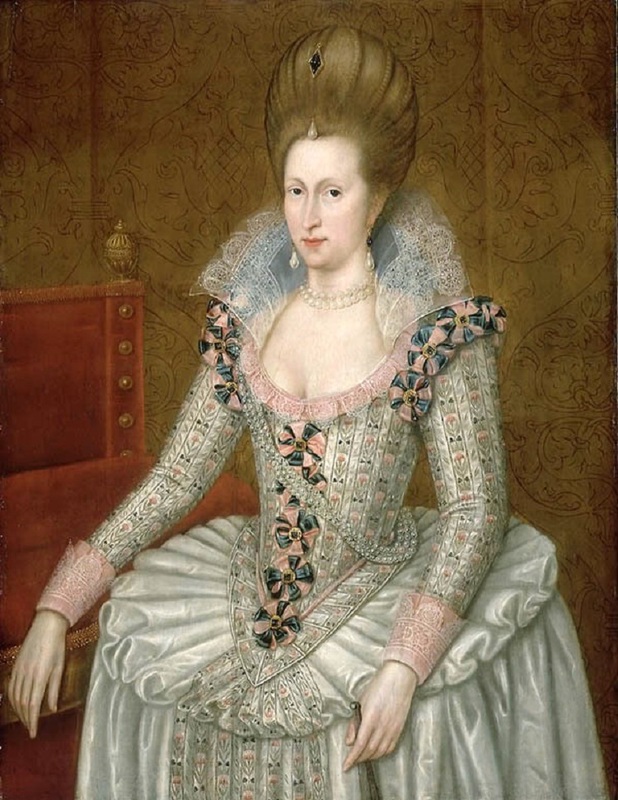 Elizabeth & Charles were in line for succession to the throne & had a daughter Arabella Stuart. Arabella's parents died, when she was young; & Bess took care of her granddaughter. By this time the Earl of Shrewsbury was fed up with his wife's vaulting ambition & tried to obtain a divorce. For many years the Shrewsburys were responsible for the guardianship of the lonely & unhappy Queen Mary Queen of Scots. The angry countess overextended herself by accusing her husband of a love intrigue with the queen of Scots, a charge which she was forced to retract before the council. In the meantime, she had told some gossip about Queen Elizabeth to Queen Mary, who made use of it in an 1584 letter. 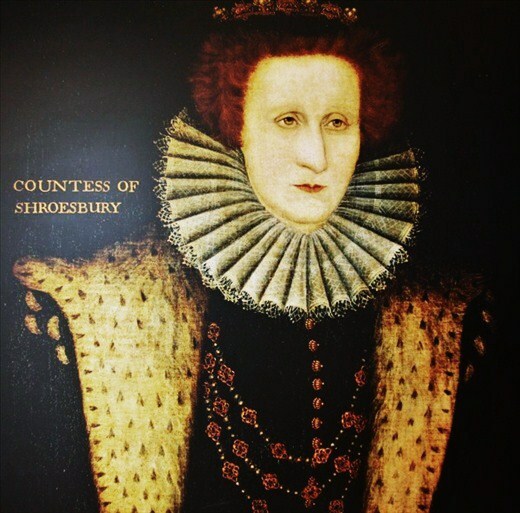 By 1584, the countess of Shrewsbury, who was certainly financially secure, was living apart from her husband, with whom she was later formally reconciled by the queen. In 1584, Bess moved from their home at Chatsworth, to the "Old" Hall at Hardwick & largely rebuilt it as a place for herself to live. However, when the Earl died in 1590, her finances became even more secure, & she immediately began the construction of the "New" Hall. "Old Hall" was abandoned & gradually became a ruin. She obviously enjoyed building, as Hardwick, Chatsworth, & Oldcoates flourished under her hand. It is said that she believed she would not die, so long as she was building. Her death came in February 1608, during a frost which had temporarily put a stop to her building operations. Unfortunately, the temporary weather problems put a permanent stop to Bess. 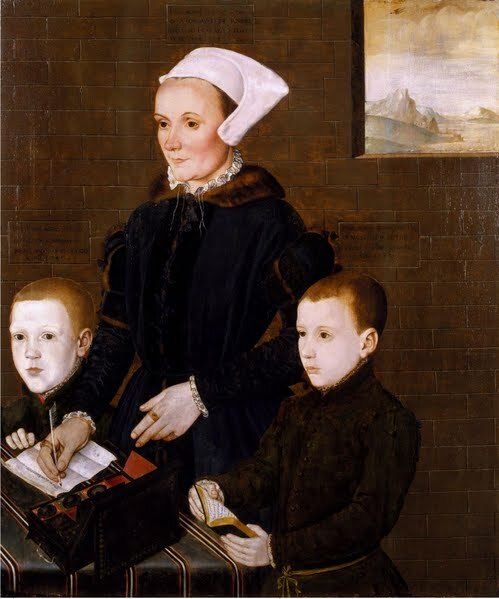 1557 Alice Bradbridge Barnham 1523-1604 with Her Sons Martin & Steven. Painting attributed to attr Hans Eworth. Alice Bradbridge Barnham (1523–1604), silkwoman & benefactor, was born on 7 September 1523 at Chichester, Sussex, one of the youngest of the 14 children of William Bradbridge (d. 1546), a successful & prosperous mercer, & his wife, Alice. Alice's father, who was a 3 term mayor of Chichester, raised his children in a tradition of civic prominence & public service. Alice probably married in 1546-47, with the ceremony most likely taking place in her home parish in Chichester. 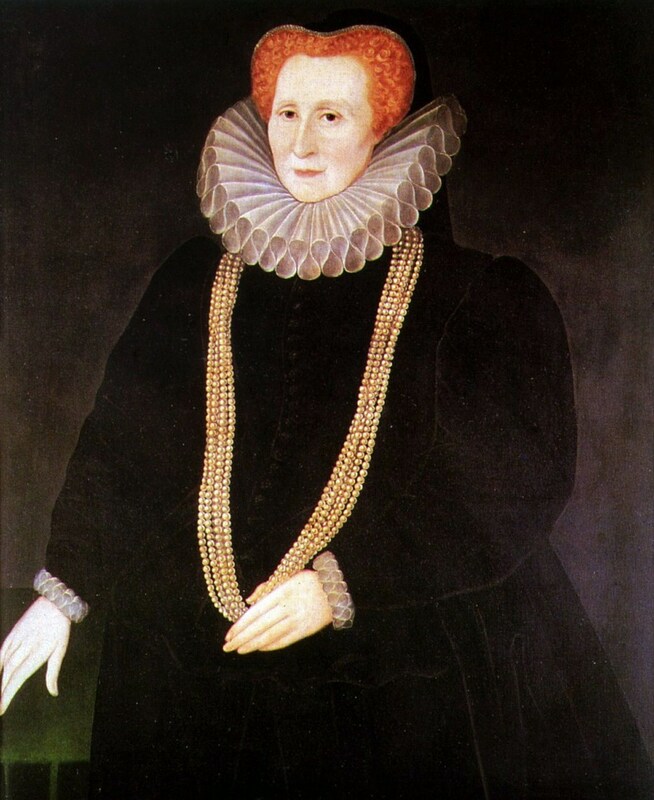 Her husband was Francis Barnham (1515/16–1576), a draper & alderman. In his will (proved in 1546) Alice's father specified a marriage portion of £10. At the time of Francis Barnham's death in 1576 the couple were realizing rental incomes of £1000 annually from properties in London, Middlesex, Surrey, Kent, Essex, Dorset, & Wales, & they had a ‘great personal estate’ of moveable goods. The family's house on St Clement's Lane, Eastcheap, once the London residence of the abbot of Stratford Langthorne, featured a stone gate & its own garden. Francis was granted a coat of arms in 1561. Francis Barnham was the son of Steven Barnham, who described himself as a yeoman in his will. Francis was first placed in the royal household but, finding this ‘a slow way of preferment’soon left to begin an apprenticeship as a draper, which he completed in November 1541. He was also a merchant adventurer &, having helped finance the failed search for a north-east passage to China, which succeeded in opening new markets in Muscovy, & he became a charter member of the Russia Company in 1555. Barnham's civic career began with a churchwardenship at St Mildred Poultry between 1554-56. By 1558 he was a common councillor (& helped build the Royal Exchange, contributing £5 in 1566). In 1559–61 & 1572–4 he was governor of the Bridewell (having supported its creation as a workhouse) as well as governor of St Thomas's Hospital (1564–70 & 1574–6, serving as treasurer in 1567–9), alderman of Farringdon Without the Walls from 1568 (switching to Tower ward in 1573), & sheriff of London in 1570–71. 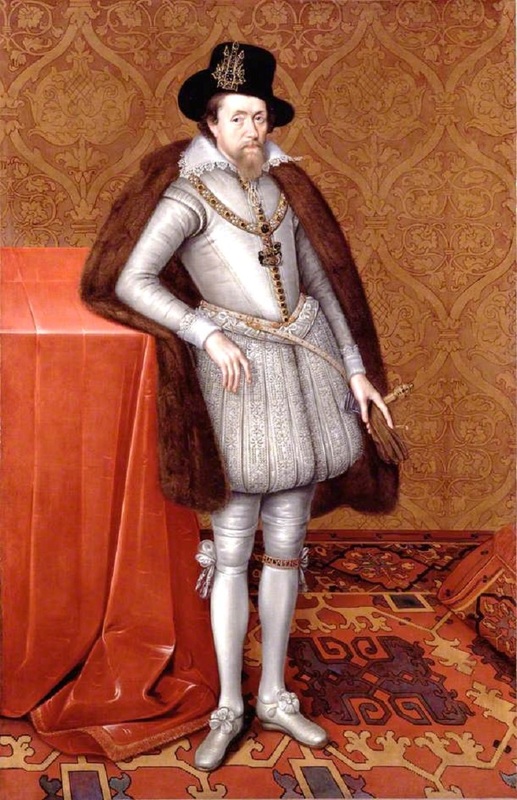 For the crown he collected fifteenths in 1558; in 1569 Elizabeth I advised her lieutenants-general that ‘one Barnham’ would bring £1500 to provision troops confronting the northern rebellion. These may have been his own funds. Francis Barnham also had a long career as a moneylender. He lent £50 to Philip & Mary in 1558, was owed more than £1400 by Elizabeth in late 1571, &—as was alleged in R. v. Barnham—lent £600 to Sir Walter Waller in 1573. Alice Barnham sold fancy fringes & points to the Drapers' Company in the early 1560s, & seems to have had the status of a professional silkwoman. Silkwork was a popular career for the wives of leading citizens who, like all freemen's wives, were authorized to operate as femmes soles, in which capacity Alice was able to bind her own apprentices, keep her own shop, & was responsible for her own debts. After her husband's death 2 years later, 2 of his apprentices worked out their terms with her. By not remarrying she protected her freedom of the city & bound at least 3 more apprentices in her own name. The female monopoly on the silk trade ended about 1570, making Alice one of the last of the London silkwomen. 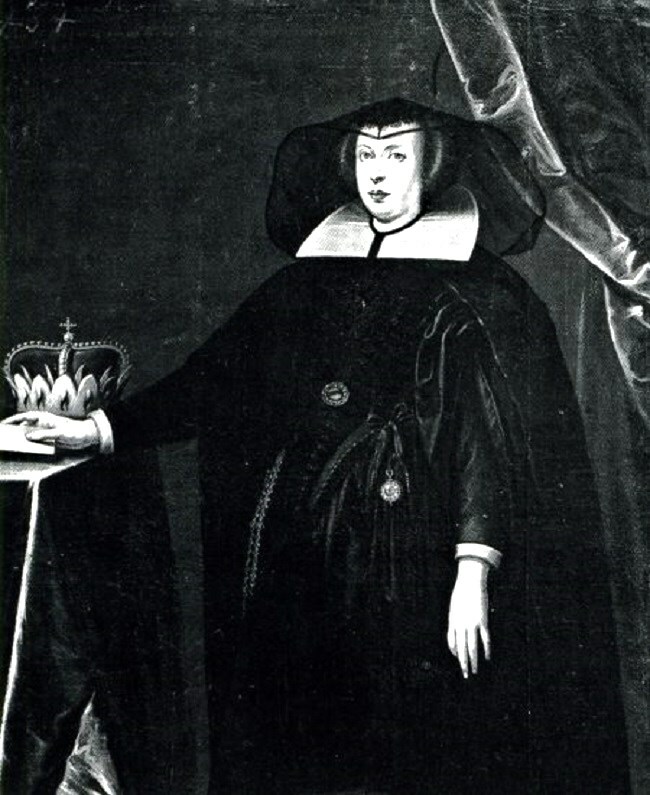 Alice Barnham is the principal subject of one of the earliest known English family group portraits. Inscriptions on the painting—‘Martin was born the 26 of March at 9 of the clock before noon in Anno Domini 1548’ & ‘Steven was born the 21 of July on a Sunday at night & 10 of the clock Anno Domini 1549’—identify Alice & Francis Barnham's eldest sons, who were baptized at St Mildred Poultry, London, on 27 March 1548 & 27 July 1549 respectively. A third inscription above the head of the female sitter—‘I was born the 7 of September on a Sunday 1523, turned from that I was unto that ye see Anno Domini 1557’—establishes Alice Barnham as the person responsible for commissioning the painting. In the portrait Alice's writing box rests on a table cover ornamented with silk ribbons. Like the blackwork lace & trimmings of her costume & those of her sons, these probably represent her own wares. On her left Martin is portrayed holding a popular protestant text, Thomas Sternhold's metrical translation, The Proverbs of Solomon (1549), which is open to the verse ‘My son receive ye these my words, the which shall be right wise’. Alice poses as if having just written in response, ‘That we all may receive the same’. Sir Francis (himself a moderate puritan) described his grandmother as ‘a constant professor of the true religion’ during ‘those times of persecution’. Between 1553-55 she is known to have taken her children to hear John Bradford preach from prison before his martyrdom. 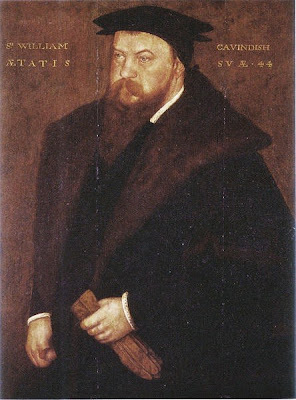 The painting has been connected on stylistic grounds with Hans Eworth, a Flemish expatriate who kept a studio in Southwark from about 1549. Francis Barnham died in 1576 aged 60 & was buried on 23 May at the parish church of St Clement Eastcheap. The tomb Alice Barnham commissioned for her husband, on the north side of the choir, was destroyed in the great fire of 1666. In 1592 she placed a brass plaque in Chichester Cathedral that is dedicated to her natal family & reads (in part): ‘This stone was finished at the charges of the Worshipful Mistress Alice Barnham, widow.’ Alice Barnham died in 1604 & was buried on 14 May. 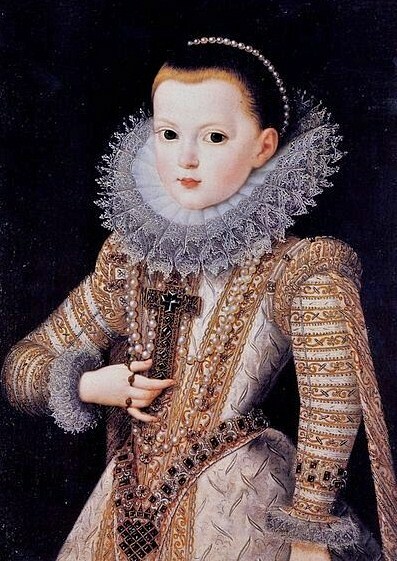 Portrait of Marie de Medici, Queen of France (1573-1642) as a young girl. Marie was the daughter of Francesco de’ Medici, grand duke of Tuscany, & Joanna of Austria. 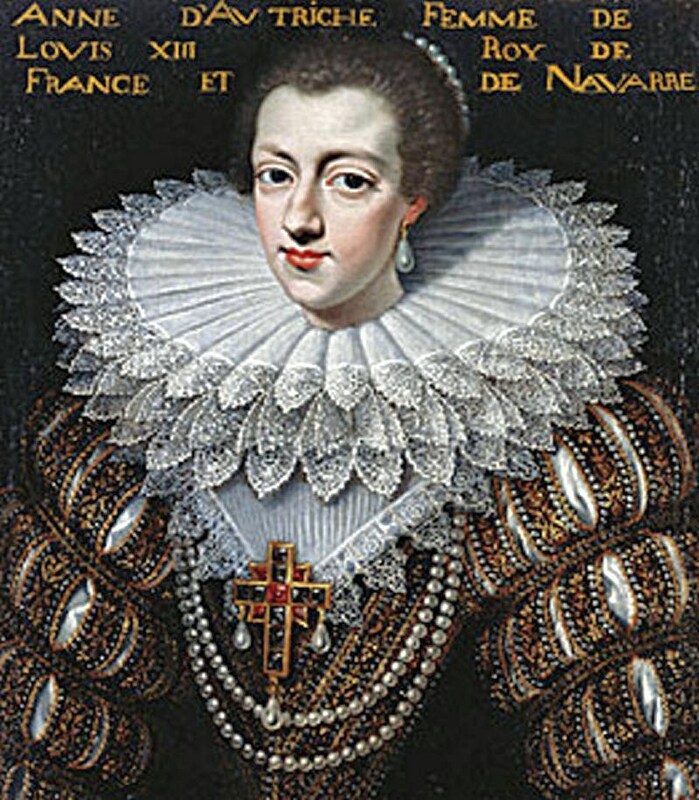 Shortly after France's Henry IV divorced his wife, Margaret, he married Marie in October 1600, ostensibly to obtain a large dowry to help pay mounting debts. Dutifully, in 1601, Marie gave birth to the dauphin Louis, the future Louis XIII. During the following 8 years, she bore the king 5 more children. Despite their ability to produce heirs, reportedly their personal relationship was strained. Apparently, Marie resented Henry’s endless infidelities, & the king despised her reportedly unscrupulous Florentine friends, Concino Concini & his wife Leonora. Upon the assassination of Henry IV on May 14, 1610, the Parliament of Paris proclaimed Marie regent for her son the young King Louis XIII. 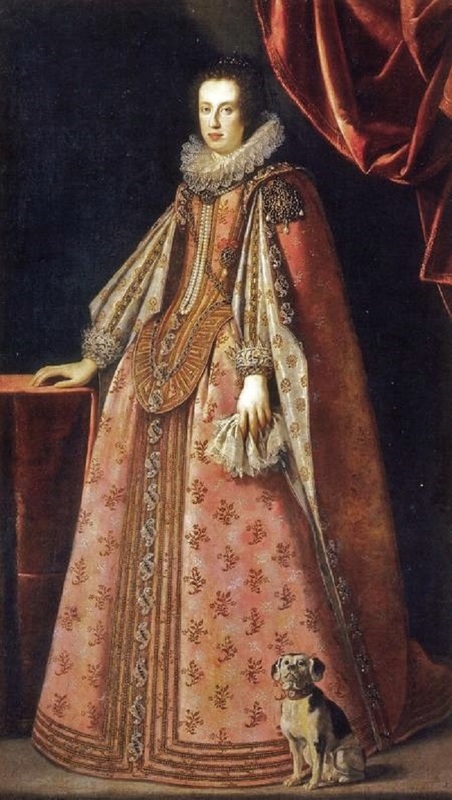 Claudia de' Medici (1604-1648) was daughter of the art collector & founder of the Villa Medici in Rome, Ferdinando I de' Medici, Grand Duke of Tuscany, & his wife Christina of Lorraine. Claudia was born in Florence, & named after her grandmother Claude of Valois, herself granddaughter of Claude, Duchess of Brittany, consort to King Francis I of France. Claudia de' Medici (1604-1648) with her dog. Her parents had already commited her to a politically expedient marriage by the age of four. Her parents then sent her to a convent to be prepared for a noble marriage. There she had lessons in the harp & the lute, painted pictures, & learned piety. The young princess had been promised to the heir to the throne of Urbino, who at age 16 wrote her a passionate love-letter, afraid that her family might give her as a bride to Emperor Ferdinand II. But her family kept to its agreement. In 1620, she married Federico Ubaldo della Rovere, the only son of Francesco Maria II della Rovere, Duke of Urbino. The young bride set out for Urbino fully expecting to bear many princes. But on her arrival she learned that her husband had installed his mistress in the palace as well & had no intention of giving up his freedom for this arranged marriage. Outraged, she fled to Pesaro. Only when Federico promised to change did she return to Urbino. Here she bore her first child in 1622, a daughter, Vittoria. The promise of her fertility proved useless with the sudden death of Federico on 29 June 1623, as she had to leave Urbino & return to the convent. 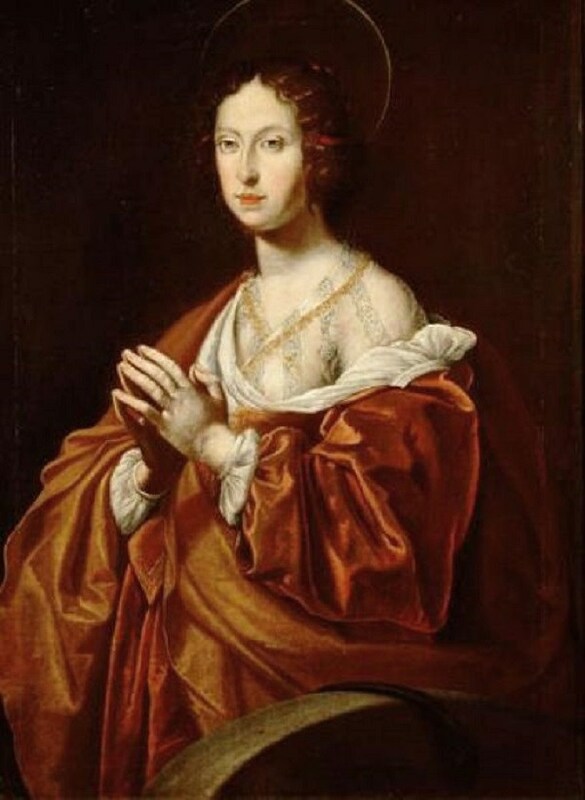 After her husband's premature death, she married a man 18 years older than she, on 19 April 1626, Leopold V, Archduke of Austria, becoming Archduchess consort of Austria. Leopold the Pious, a bishop & the sovereign of Tirol, was a friend of the fine arts, just as her father had been. Another benefit for Claudia was that she could marry a former cleric, presumably free of sin & debauchery which accompanied her 1st marriage. Both newlyweds enjoyed their unexpected new companionship. 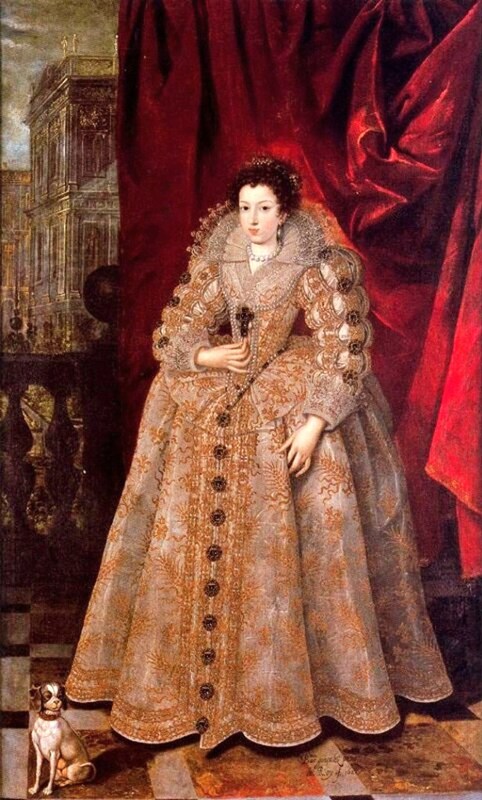 Between 1627 & 1632, she bore 5 children, 3 princesses & 2 princes. 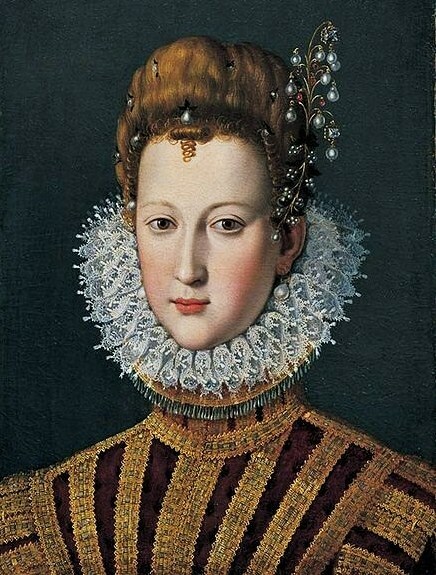 At age 28, Claudia de’ Medici was widowed again. But Leopold had decreed in his will that in the event of his demise, she should continue to rule Tyrol. 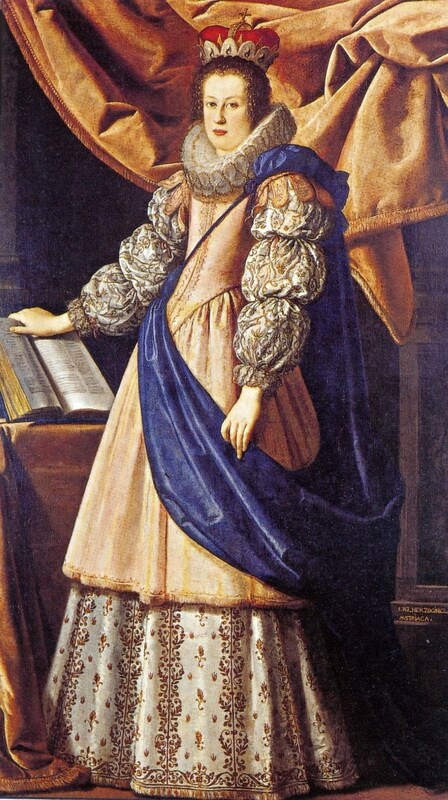 Claudia de' Medici (1604-1648), As a Widow wearing a veil on her forehead where the lace of the veil imitates the widow’s peak, a tradition for widows for at least 2 prior centuries. Before her son came of age, she would rule as an independent reign of 14 years. In 1632, she assumed a regency in the name of her son Ferdinand Charles who was the ruler of the Princely County of Tyrol. 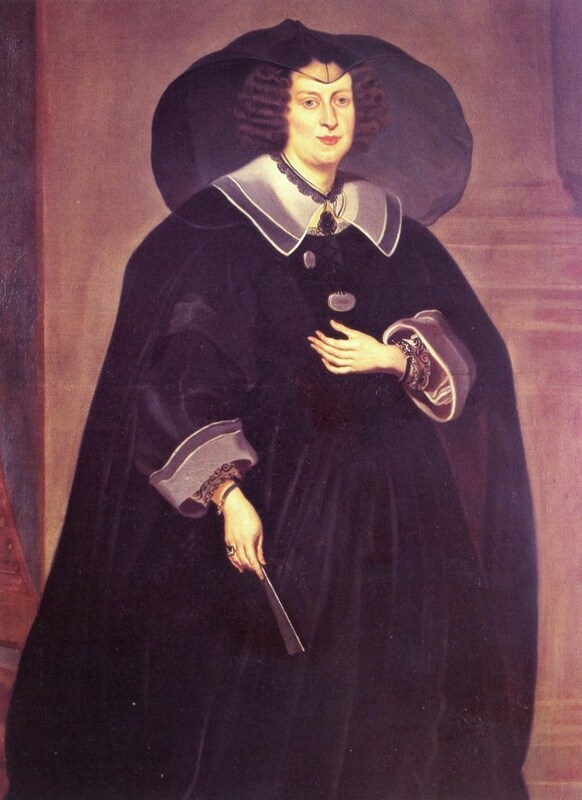 Claudia held the post until 1646. Claudia de' Medici (1604-1648) Archduchess of Austria by Franz Luycx (Flemish artist, 1604-1668) c 1635 wearing a veil on her forehead where the lace of the veil imitates the widow’s peak, a tradition for widows for at least 2 prior centuries. During her reign, the Thirty Years War threatened Tyrol. Troops of France & of the Swedish king threatened the borders of Tyrol. Claudia de’ Medici strengthened the Tyrolian militia, had fortifications built, & concluded an alliance with Spain & Emperor Ferdinand II. 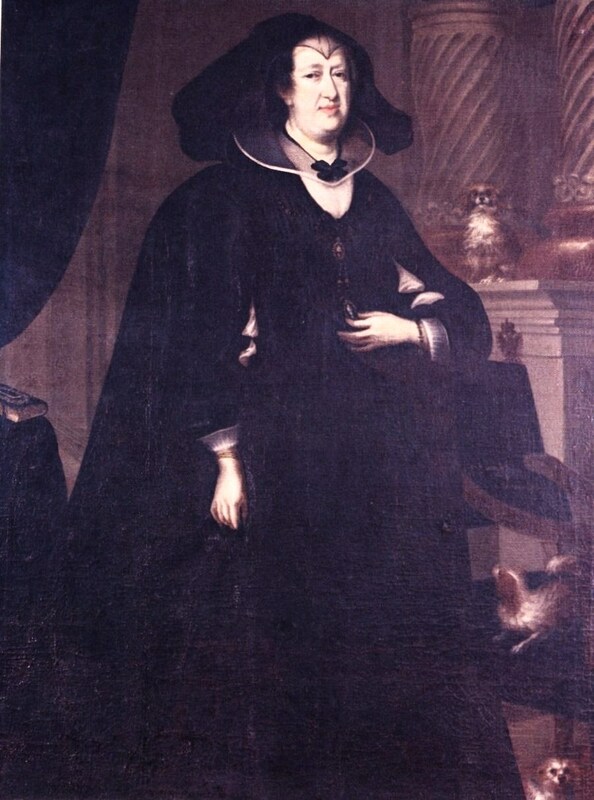 Claudia de' Medici (1604-1648), Widow wearing a veil on her forehead where the lace of the veil imitates the widow’s peak, a tradition for widows for at least 2 prior centuries. In internal affairs, she wamted Innsbruck to become a clean city. Innsbruck’s streets were paved, & preventive measures were taken against fires & epidemics. She fostered trade, developed fisheries, & planted mulberry bushes for silk production. 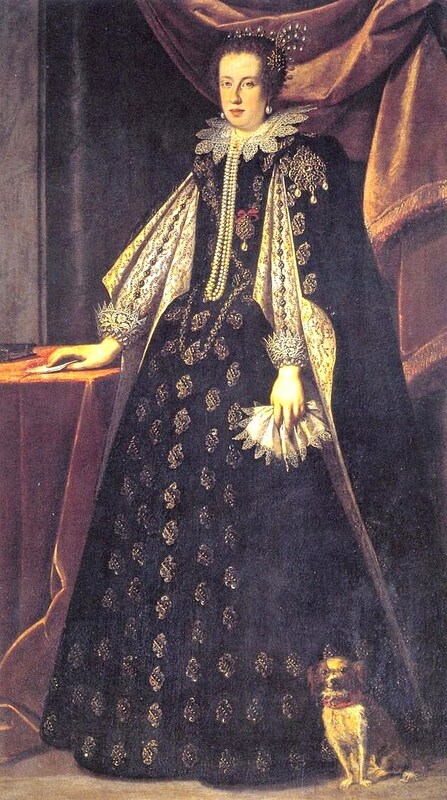 Claudia de' Medici died within 2 years of Ferdinand Charles taking control. Claudia de' Medici (1604-1648) Archduchess of Austria by Franz Luycx (Flemish artist, 1604-1668) c 1640 Here she is painted with 2 dogs & wearing a veil on her forehead where the lace of the veil imitates the widow’s peak, a tradition for widows for at least 2 prior centuries. Anne of Austria (1601–1666) was Queen consort of France & Navarre, regent for her son, Louis XIV of France, & a Spanish Infanta by birth. During her regency (1643–1651) Cardinal Mazarin served as France's chief minister. 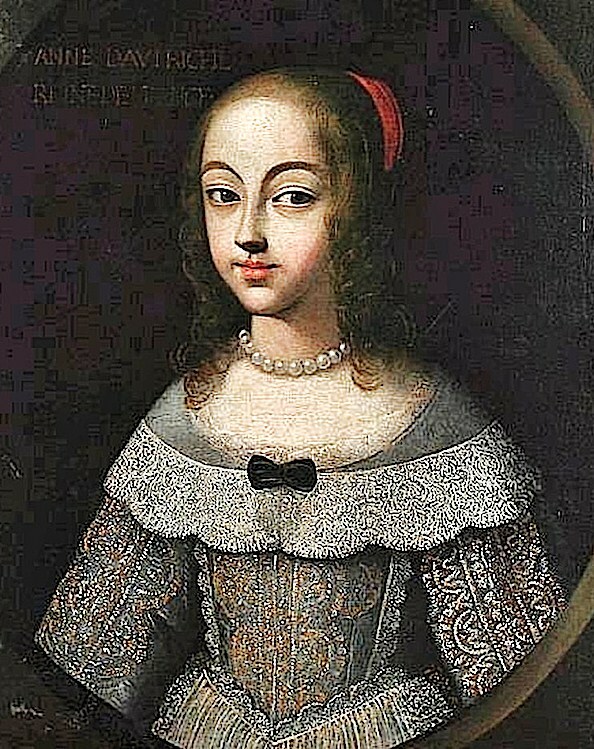 Born at Benavente Palace in Spain, & baptised Ana María Mauricia, she was the eldest daughter of 2 Habsburg parents, Philip III of Spain & Margaret of Austria. She held the titles of Infanta of Spain & of Portugal & Archduchess of Austria. 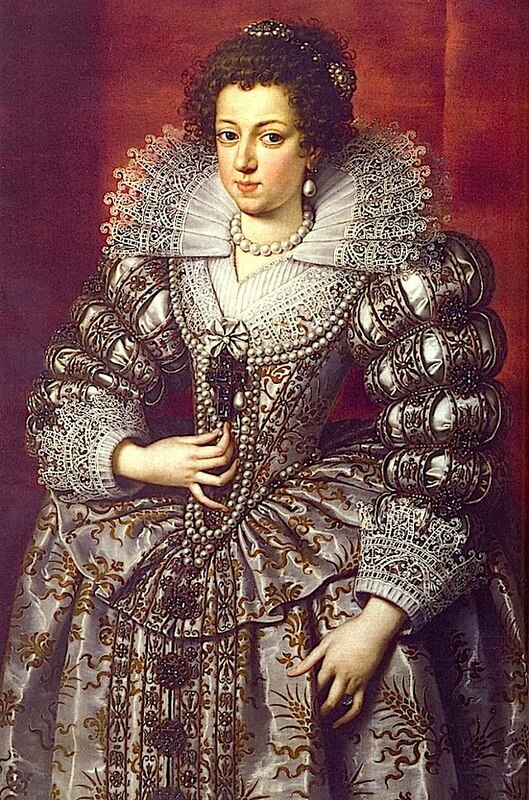 Despite having been a native of Spain, she was referred to as "of Austria," because the Habsburgs were originally from Austria. 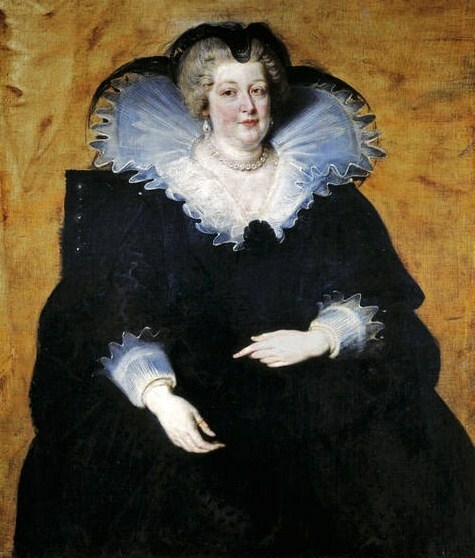 Anne was raised mainly at the Royal Alcazar of Madrid. Unusually, Anne grew up close to her parents, & lived a rather calm & orderly life compared to other royal children. Her parents were very religious; & she often visited monasteries as a child. When she was 10 in 1611, she lost her mother, who died in childbirth. As the oldest girl, Anne did her best to take care of her younger siblings, who referred to her with affection as mother. 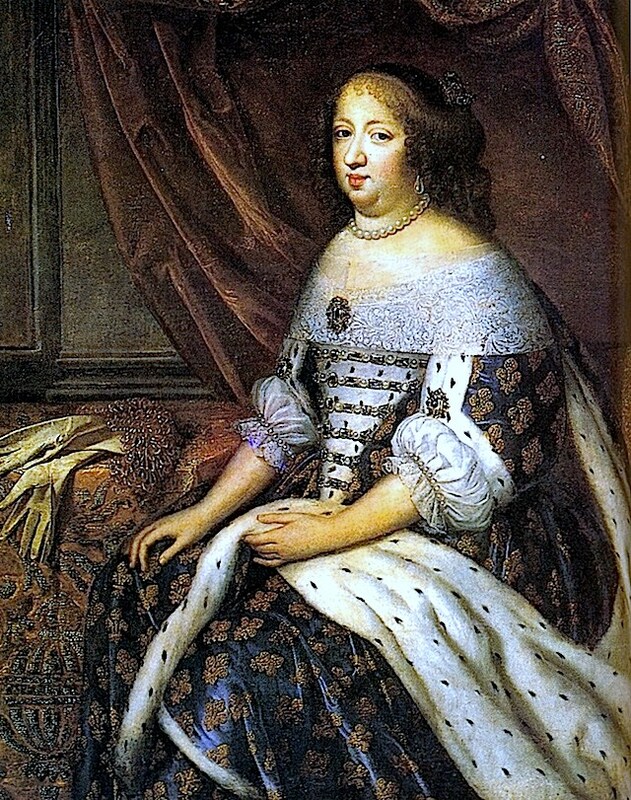 Anne was betrothed at age 11 to Louis XIII. Her father gave her a dowry of 500,000 crowns plus costly jewels. 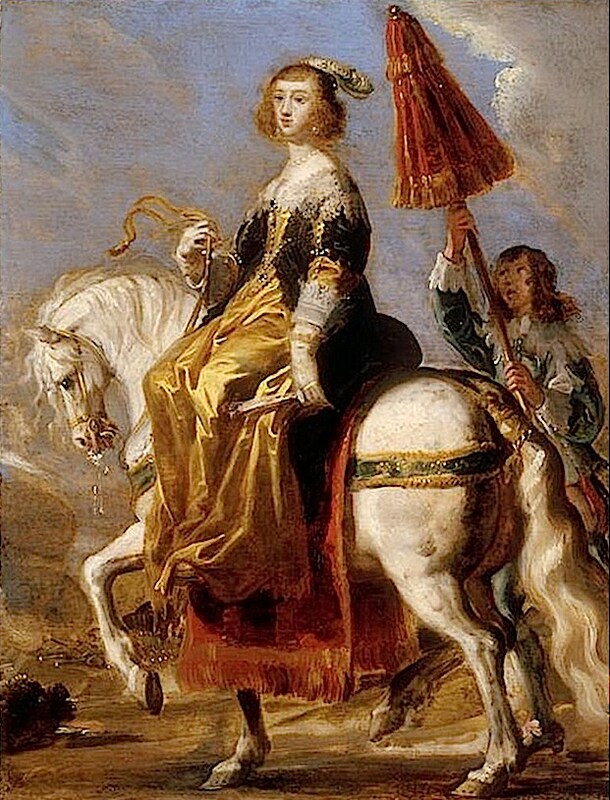 For fear that Louis XIII would die early, the Spanish court stipulated that Anne would return to Spain with her dowry, jewels, & wardrobe, if he did die. 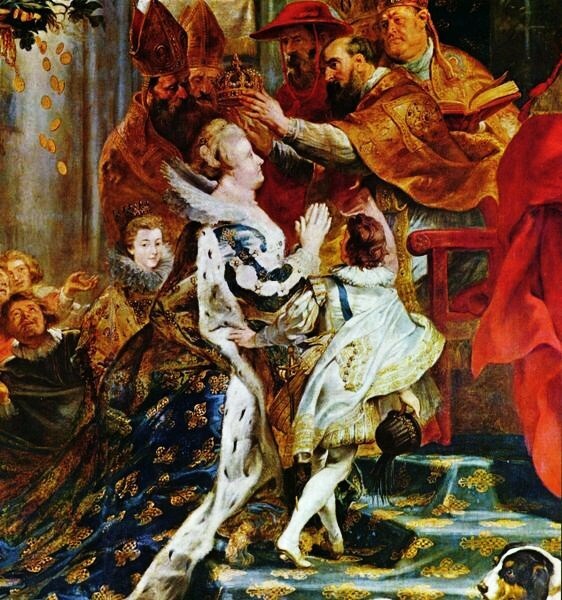 The financial pre-nuptual agreement, between nations rather than bride & groom, concluded, Anne was saluted as the Queen of France, "a dignity which her Highness accepts with marvellous dignity & gravity." By agreement, Anne renounced all succession rights of herself & her descendants by Louis, with a provision that, she would resume her rights should she be left a childless widow. In 1615, Louis & Anne were married by proxy in Burgos, while Louis's sister, Elizabeth, & Anne's brother, Philip IV of Spain, were married by proxy in Bordeaux. These marriages followed the tradition of a matrimonial cementing of military, financial, & political alliances between France & Spain. Anne was lively & beautiful during her youth. She was also a noted equestrian. At the time, Anne had many admirers, including the handsome Duke of Buckingham, although her intimates believed their flirtations remained chaste. Anne & Louis, both 14 years old, were pressured to consummate the marriage in order to forestall any possibility of future annulment, but Louis wasn't interested & ignored his bride. 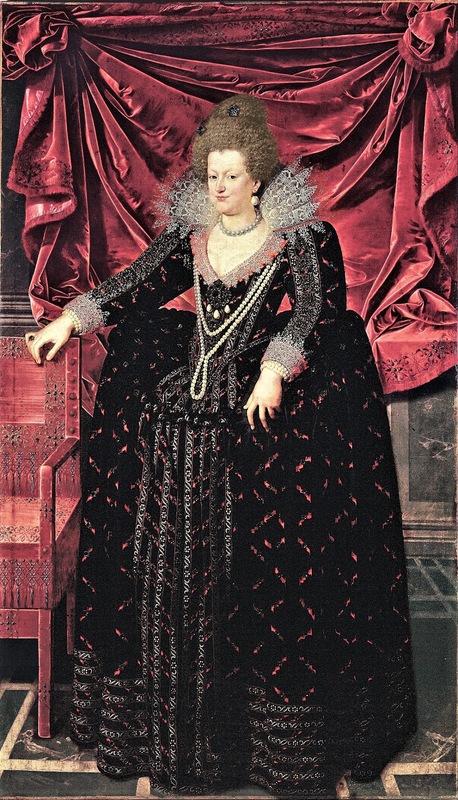 Louis's domineering mother, Marie de' Medici, continued to conduct herself as queen of France, without showing any deference to her young, new daughter-in-law. Newlywed Anne, surrounded by her entourage of high-born Spanish ladies-in-waiting, continued to live according to Spanish etiquette & did not attempt to improve her French. In 1617, Louis conspired with Charles d'Albert, duc de Luynes, to dispense with the influence of his overbearing mother in a palace coup d'état, having her favorite Concino Concini assassinated in April of that year. During the years he was influential at court, the duc de Luynes attempted to remedy the formal distance between Louis & his queen. He knew they would need an heir. He sent away the Spanish ladies & replaced them with French attendants, notably the princesse de Conti & Marie de Rohan-Montbazon, his wife, & organized court events that would bring the couple together under amiable circumstances. 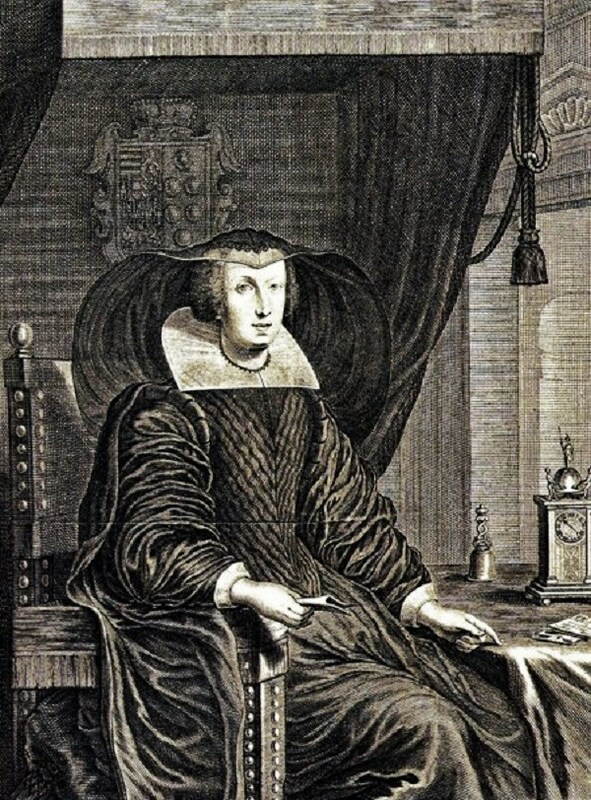 With her Spanish friends dispatched back to their homeland, Anne began to dress & speak in the French manner; & in 1619, Luynes pressed the King to bed his queen. Some affection did develop, as Louis became distracted during a serious illness of his queen. 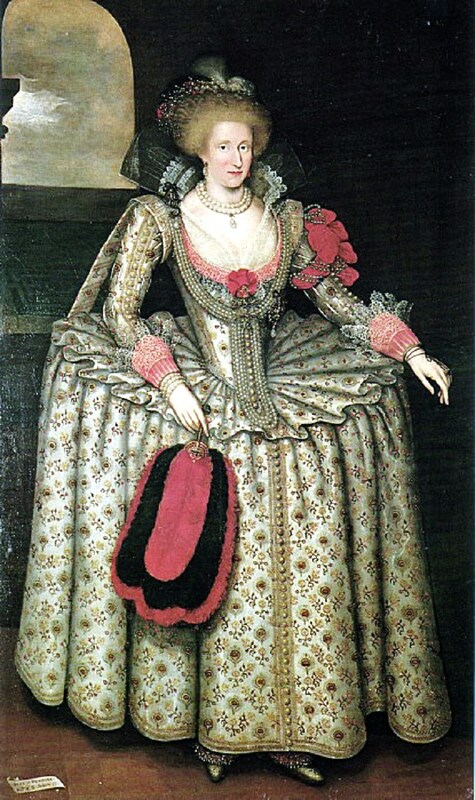 In 1622, while playing with her ladies, Anne fell on a staircase & suffered her 2nd miscarriage. Louis blamed her & was angry with Madame de Luynes for having encouraged the queen in what was seen as negligence. A series of continuing miscarriages disenchanted the King & put a chill on their relationship. 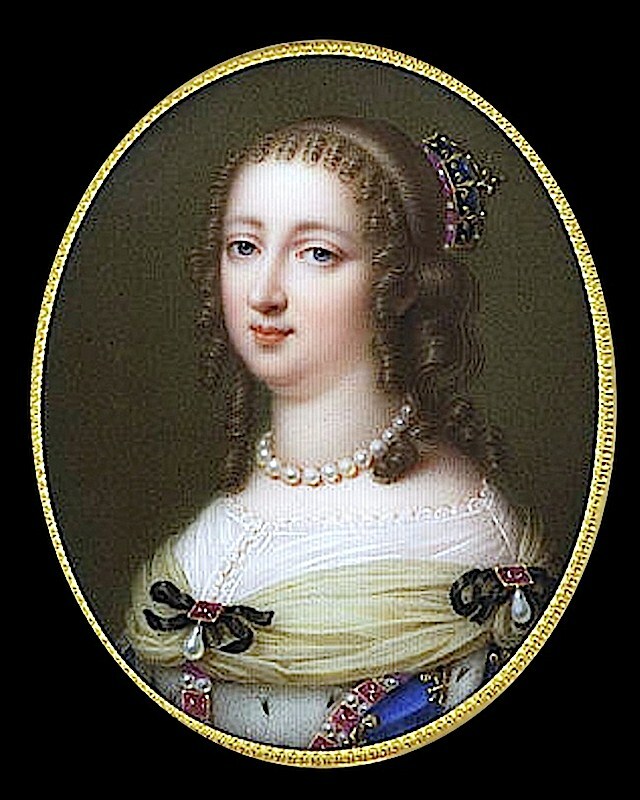 The King began to have less tolerance for the influence the duchesse de Luynes had over Anne. Luynes died in 1621. The King's attention was monopolized by his war against the Protestants. Louis turned now to Cardinal Richelieu as his advisor, who was his 1st minister from 1624. Richelieu's foreign policy of struggle against the Hapsburgs, who surrounded France on 2 fronts, inevitably created tension between himself & Anne, who continued to remain childless for another 16 years. 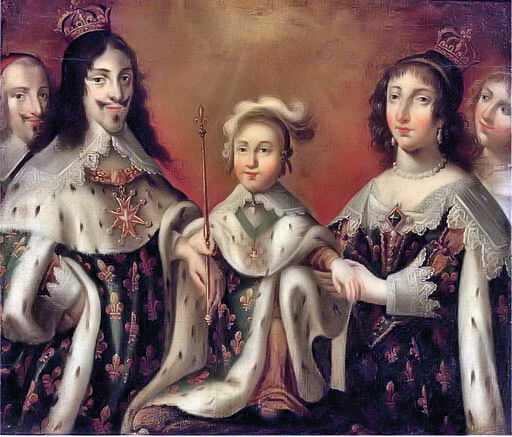 Louis XIII, Anne of Austria, and their son Louis XIV, flanked by Cardinal Richelieu and the Duchesse de Chevreuse. 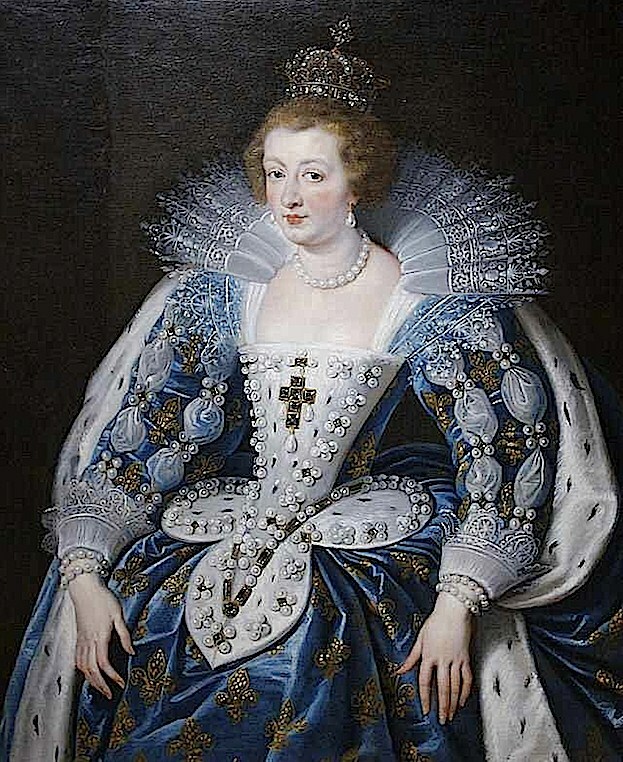 Under the influence of the duchesse de Chevreuse, the queen let herself be drawn into political opposition to Richelieu & became embroiled in several intrigues against his policies. 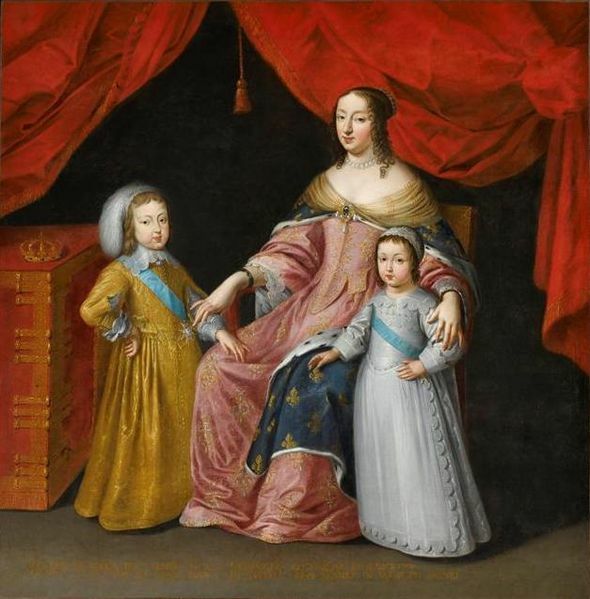 Anne of Austria with her sons the future King Louis XIV of France, and Philippe I, Duke of Orléans. Vague rumors of her betrayal circulated in the court, notably her supposed involvement with the conspiracies of the comte de Chalais that Chevreuse organized in 1626. 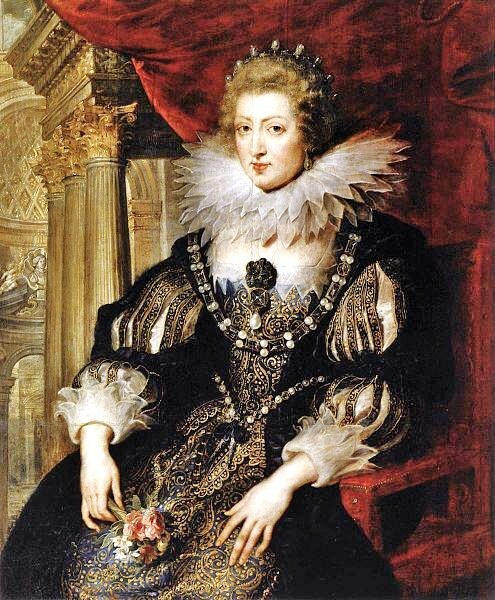 In 1635, France declared war on Spain, placing the Queen in an untenable position. Her secret correspondence with her brother Philip IV of Spain passed beyond the bonds of sisterly affection. 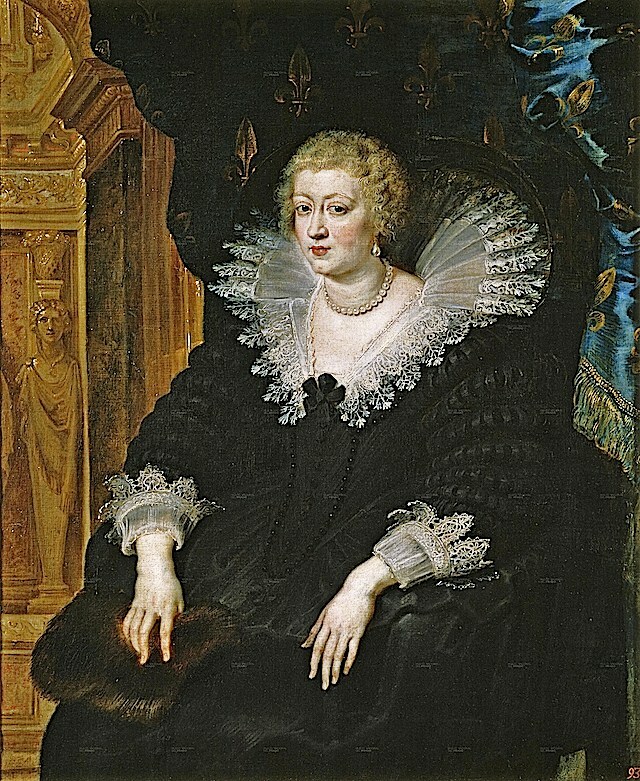 In August 1637, Anne came under so much suspicion, that Richelieu forced her to sign covenants regarding her correspondence, which was henceforth open to court inspection. Surprisingly, in such a climate of distrust, the queen became pregnant once more, a circumstance that contemporary gossip attributed to a single stormy night that prevented Louis from traveling & obliged him to spend the night with the queen. Louis XIV was born on 5 September 1638, securing the Bourbon line. At this time, Anne was 37. The official newspaper Gazette de France called the birth "a marvel when it was least expected." One German diplomat would refer to the King's "quite extraordinary birth" 40 years after the event. 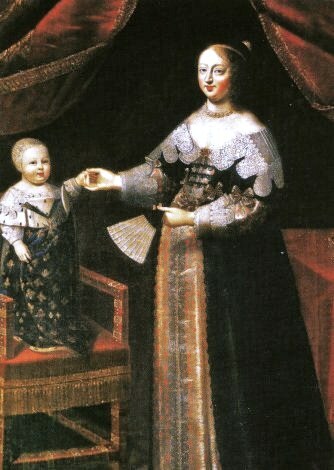 The birth soon afterwards of a 2nd son failed to re-establish any affection between the royal couple. Anne's 2nd son, Philippe de France, Duke of Anjou & would found the modern House of Orléans. Richelieu made Louis XIII a gift of his palatial hôtel, the Palais Cardinal, north of the Louvre, in 1636; but the king never took possession of it. Anne fled to the Louvre to install herself there with her 2 small sons, & remained as regent (hence the name Palais-Royal that the structure still carries). Louis tried to prevent Anne from obtaining the regency after his death, which came in 1643, not long after that of Richelieu. Anne was named regent upon her husband's death in spite of her late husband's wishes. With the aid of Pierre Séguier, she had the Parlement de Paris revoke the will of the late king, which would have limited her powers. Their 4-year-old son was crowned King Louis XIV of France. Anne assumed the regency but to general surprise entrusted the government to the chief minister, Cardinal Mazarin, who was a protegé of Cardinal Richelieu. Mazarin left the hôtel Tuboeuf to take up residence at the Palais Royal near Queen Anne. Before long he was believed to be her lover. Anne with her niece & daughter-in-law, Maria Theresa of Spain, & grandson, Louis. Two Queens of France Anne d'Autriche with her niece & daughter-in-law, Marie-Thérèse d'Espagne, who holds her son. With Mazarin's support, Anne overcame a revolt of aristocrats, led by Louis II de Bourbon, Prince de Condé, that became known as the Fronde. In 1651, when her son Louis XIV officially came of age, her regency legally ended. 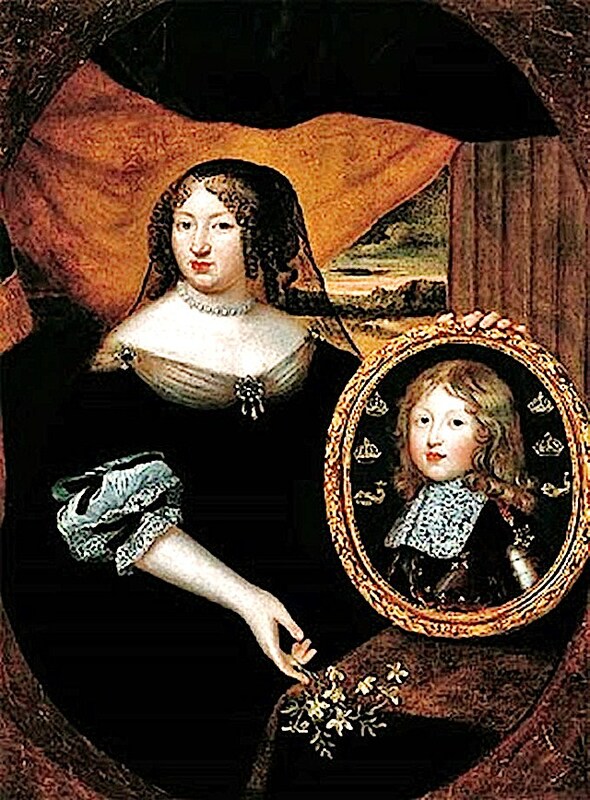 However, she kept much power & influence over her son until the death of Mazarin in 1661. In 1659, the war with Spain ended with the Treaty of the Pyrenees. The following year, peace was cemented by the marriage of the young King to Anne's niece, the Spanish Hapsburg princess Maria Theresa of Spain. 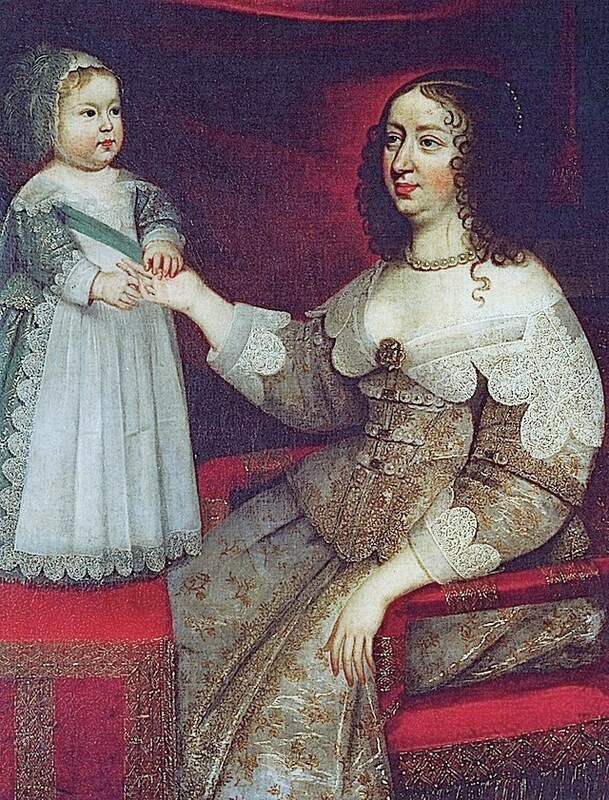 In 1661, the same year as the death of her friend & confidant Mazarin, an heir to the throne was born, Anne's 1st grandchild Louis de France. Soon Anne retired to the convent of Val-de-Grâce, where she died of breast cancer 5 years later. Her lady-in-waiting Madame de Motteville wrote the story of the queen's life in her Mémoires d'Anne d'Autriche. 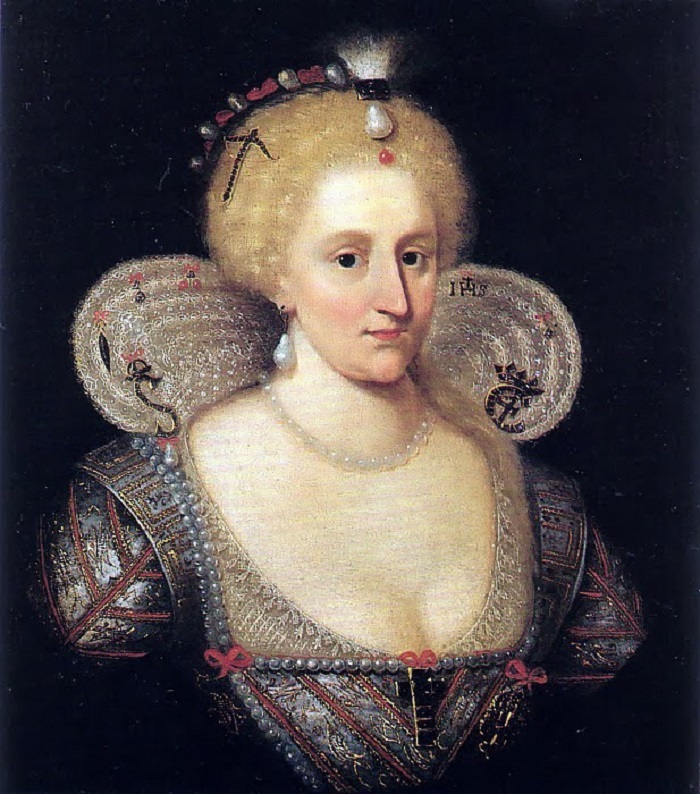 Biography - Anne of Denmark 1574-1619 - the ups & downs of being married to King James VI & I.
Anne of Denmark (1574–1619) was queen consort of Scotland, England, & Ireland as the wife of James VI & I (1566-1625). 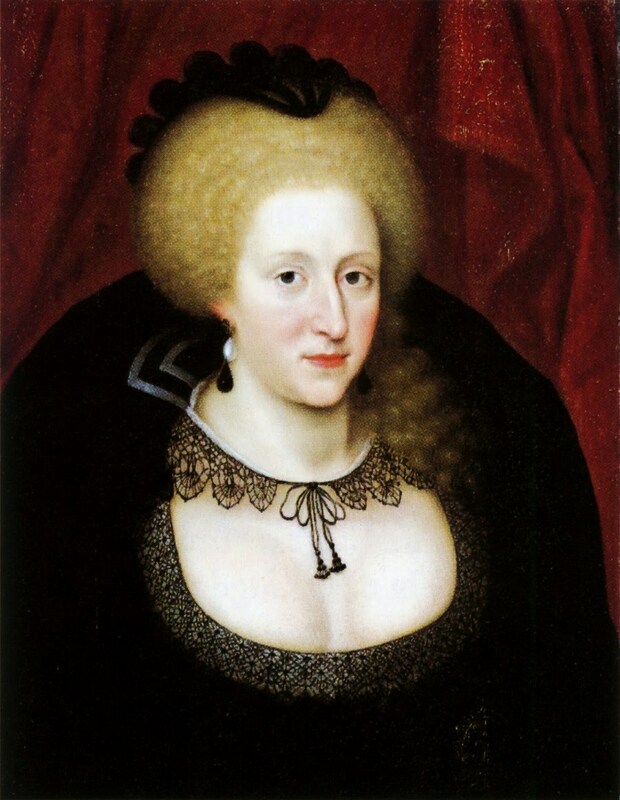 1578 Queen Anne's mother Sophie of Mecklenburg-Güstrow (1557-1631) was a German noble and Queen of Denmark and Norway. 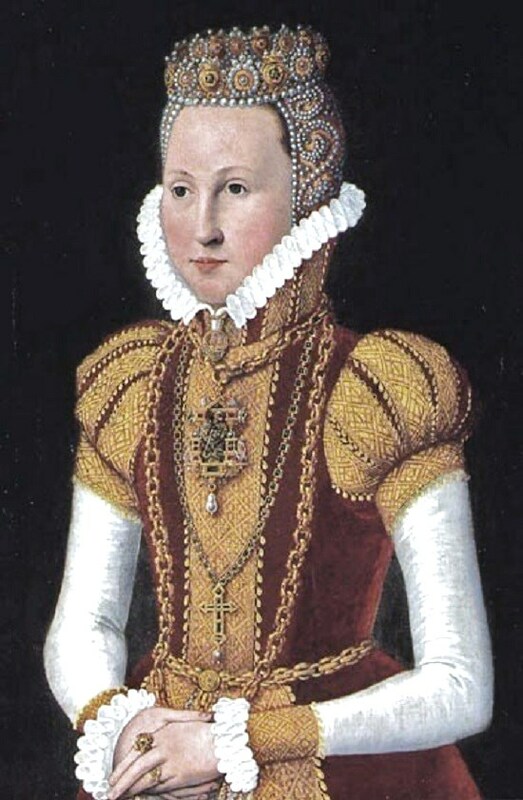 The 2nd daughter of alcoholic King Frederick II of Denmark & his wife Sophia of Mecklenburg-Güstrow, a descendant of King Hans of Denmark, Anne married James in 1589 at the age of 14. 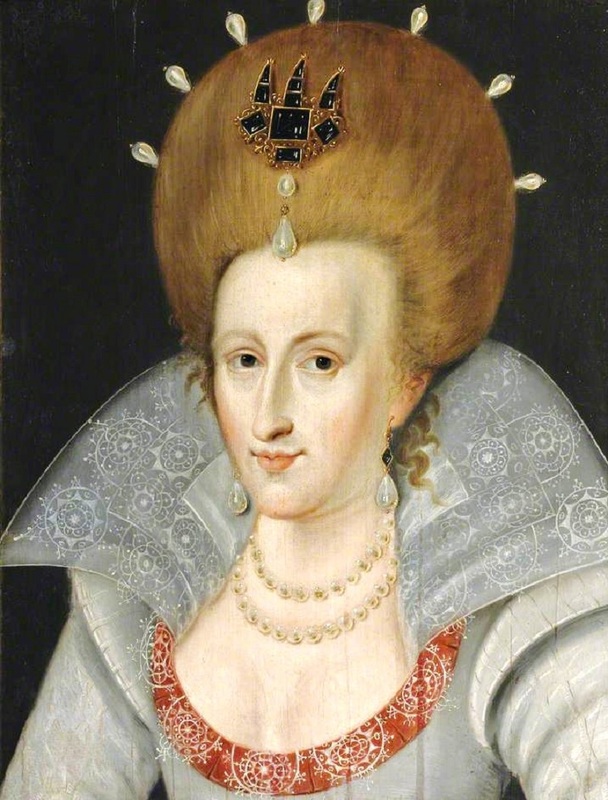 17 May 1590, Anne of Denmark was crowned Queen of Scotland. Fourteen-year-old Anne was immediately under pressure to provide James & Scotland with an heir, but with no sign of a pregnancy in 1590-93, Presbyterian antagonists felt free to talk of James’s "fondness for male company" & whispered against Anne "for that she proves not with child." Anne finally produced an heir, Prince Henry Stuart, in early 1594. The royal couple eventually had 7 children, of whom 3 survived infancy. Two sons, Henry & Charles (later Charles I), & a daughter, Elizabeth, survived into adult life. 1603 Queen Anne's daughter Princess Royal, daughter of James I & VI. She married Frederick V, Elector Palatine at 16, having many children of which 7 reached adulthood. 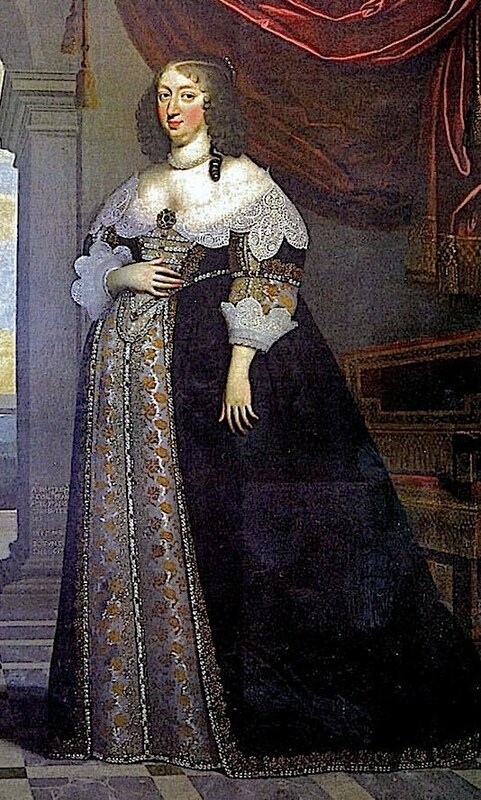 She was Queen consort of Bohemia only 1 winter. Some called her The Winter Queen. A lady at court described Queen Anne, "Her features were not regular but her complexion was extremely fair & she had the finest neck that could be seen, which she took care it should be." Fourteen-year-old Anne appears to have cared for James when they 1st married. 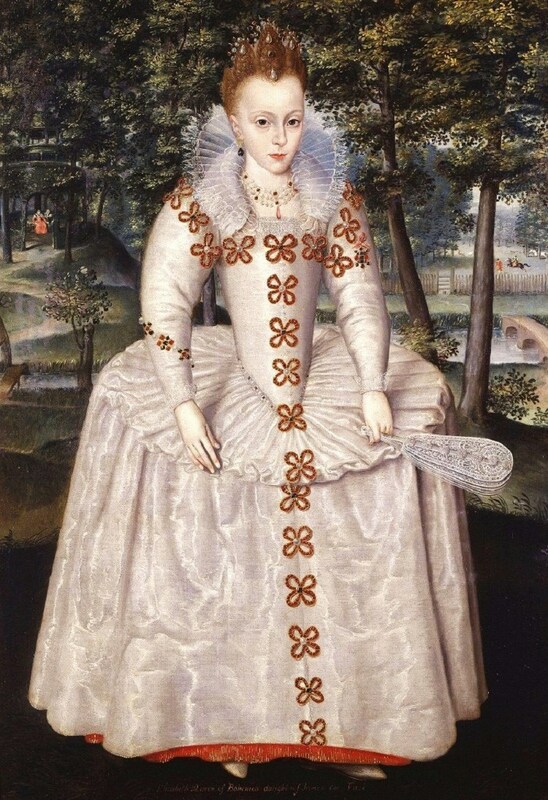 On 28 July 1589, the English spy Thomas Fowler reported that Anne was "so far in love with the King's Majesty as it were death to her to have it broken off & hath made good proof divers ways of her affection which his Majestie is apt in no way to requite." 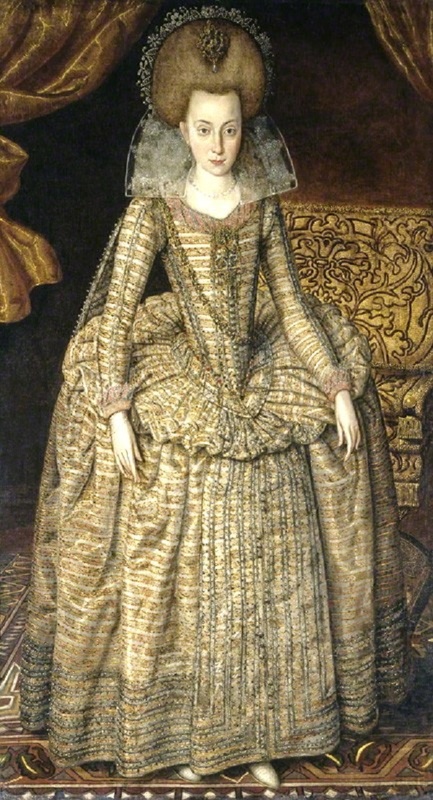 Anne was crowned queen in 1590. During the bazaar 7-hour ceremony, her gown was opened by the Countess of Mar for presiding minister Robert Bruce to pour "a bonny quantity of oil" on "parts of her breast and arm," so anointing her as queen. Ministers objected, but James insisted that the rite was from the Old Testament. 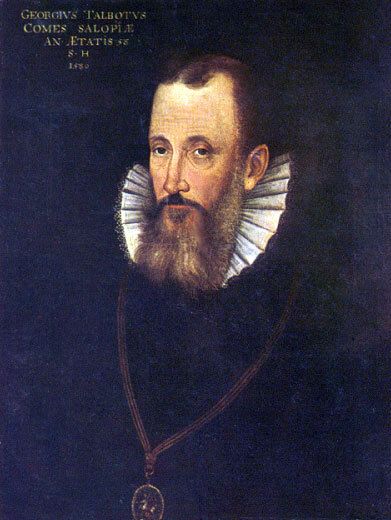 Although James had a mistress in 1593-1595, (Anne Murray, later Lady Glamis); in Basilikon Doron, written 1597–1598, James described marriage as "the greatest earthly felicitie or miserie, that can come to a man." Historians have noted, however, "All his life, except perhaps for 6 short months, King James disliked women, regarding them as inferior beings. All his interest was centered on the attractions of personable young men." The couple gradually came to live apart, though, apparently, some degree of mutual respect & affection survived. Anne demonstrated an independent streak & was willing to use factional Scottish politics in her conflicts with James over the custody of Prince Henry. Anne would do whatever she had to in order to have a hand in the raising of her children. After 1607, Anne & James lived apart, she in London & he in the countryside at Royston. Anne's chaplain, Godfrey Goodman, summed up the royal relationship: "The King himself was a very chaste man, and there was little in the Queen to make him uxorious; yet they did love as well as man and wife could do, not conversing together." In England, Anne shifted her energies from factional politics to parenting & to patronage of the arts. She constructed a magnificent court of her own, hosting one of the richest cultural salons in Europe. She was a considerable force as a patron of the arts during the Jacobean age. 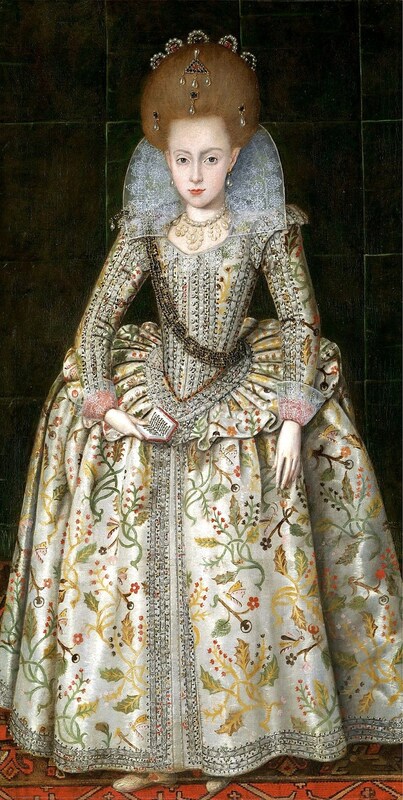 After 1612, she suffered sustained bouts of ill health gradually withdrawing from the center of court life. A bitter confrontation between James & Anne occurred in 1613, when Anne shot James's favorite dog dead during a hunting session. After his initial rage, James smoothed things over by giving her a £2,000 diamond in memory of the dog, whose name was Jewel. 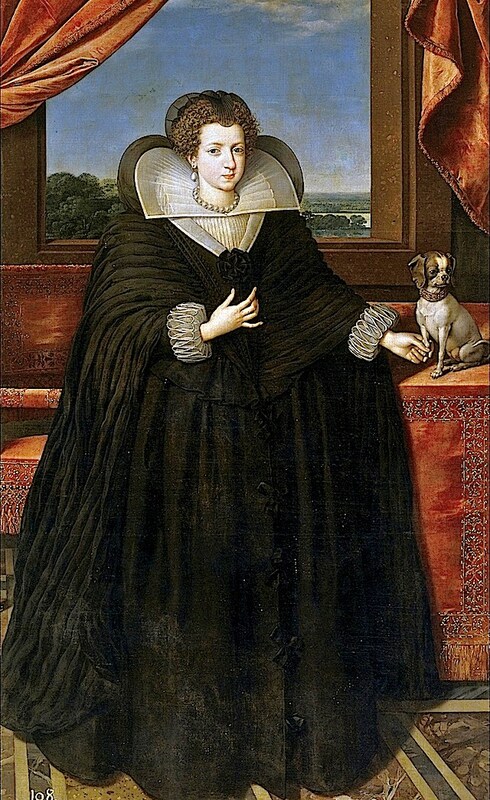 By late 1617, Anne's bouts of illness had become debilitating. 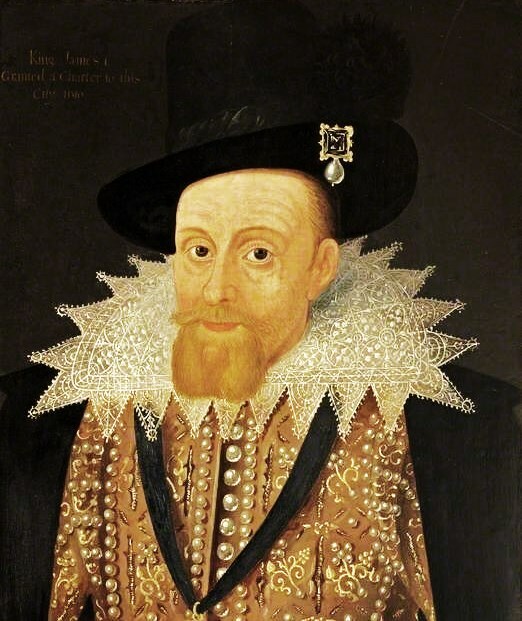 John Chamberlain wrote, "The Queen continues still ill disposed and though she would fain lay all her infirmities upon the gout yet most of her physicians fear a further inconvenience of an ill habit or disposition through her whole body." Though she was reported to have been a Protestant at the time of her death, some believe that evidence suggests that she may have converted to Catholicism at some stage in her life. 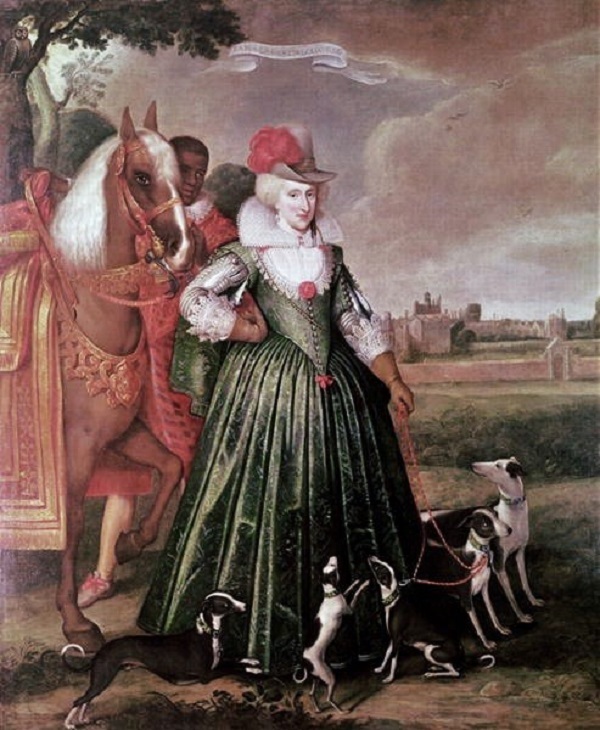 1617 Paul van Somer (c 1577-1621) Anne of Denmark 1574-1619 queen of James VI & I. But, as the sun, sets, only for to rise."